The main architectural feature of coastal housing was the importance of its orientation towards the sea. In siting houses, not only was it necessary to take account of the strong shamal winds from the north and the sun’s cycle, but there was also good reason to take advantage of the cooling effects of on-shore and off-shore breezes. Although the first houses adjacent to the sea were of simple, single storey construction as could be seen at Salata and Bida in Doha, increasing density required a second floor to be added from which the cooling breezes could be enjoyed. These invariably faced the sea. In Doha and Wakra this permitted the advantage of building on the north and west sides of compounds, and in the north of the country settlements such as Ruweis were able to face north, the shamal – coming over the sea – not bringing the dust with it which was such a problem in the rest of the country. The houses at Wakra, facing the sea to their east, had the normal disadvantage of having their long walls face west and the strong, setting sun. This may well be the reason why there were so many wind towers and badgheer to bring cooling breezes into the individual developments. These two-storey developments – the best of them in quality being in Wakra – were distinguished by their relatively tall proportions and the arcaded form of their second storeys. The integral wind towers would have helped to bring down cool air into the houses, but the second storeys facing the sea directly also would have been able to catch and draw down some amount of the cool sea breezes. In addition to affecting the micro-climates of the individual houses they also had an effect in moving air within the relatively narrow adjacent sikka, or passageway which gave access to the house. This system worked well until the advent of wall-mounted air-conditioning units which introduced a range of problems. Passage through the sikkak became unpleasant through the heat exhausted into the sikkak as well as the accompanying reverberating noise. In addition the condensate was allowed to drip into the pedestrian areas creating a mess if not a danger from slipping for pedestrians. All this was exacerbated by the danger of hitting your head on them from their inconsiderate location. 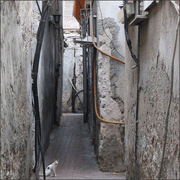 This photo to the right was taken in Dubai in 2003, and is not typical of sikkak in Doha either in the past or today, but I have included it here as it certainly illustrates what happened with the addition of modern utility systems to old buildings. You can see that this was taken in an old area of Doha by the size of the palm tree in the background. But you can also see that this is not an area where Qataris are living by the state of the sikka. It appears that the sikka has been taken over partially as a living area by those living in the adjacent housing, but my real purpose for including this photograph is to illustrate how wall-mounted air-conditioners affect the area outside the house. Apart from the visual effect, they can hinder movement, be dangerous to pedestrians and the water from the air-conditioners spills onto the ground. This photo was taken in Doha, but not in the central area. Note two other points from all three photographs: firstly, the narrowness of the sikka and, in the first and third, the modern paving that would originally have been clean suban, shell sand, maintained by the adjacent residents. Incidentally, you can also see in comparing the lower two photos with the first of them, the relatively dramatic difference created when it is possible to see planting from the sikka. an insulating and lightweight element of roof and early cementitious structural material. Its great disadvantage as a building material was, of course, its salt content. Its advantage was that fine dust and sand fell through it, it is an attractive material, and it doesn’t blow in the wind. But the traditional sikkak of Doha still exist in the more modern parts of the city. Regrettably they are generally not designed in the traditional manner even though they fulfil the traditional purpose – of moving people through the appropriate areas with some degree of protection from the sun. However, modern uses and, particularly, the lack of ownership by those living adjacent to the sikkak means that there is no responsibility felt and, as a consequence, they are not maintained well. In this photo you can see utilities fixed to walls, tiles missing from the pavement, rubbish scattered around and a general feeling of disregard and disrepair. As I have written about above, the provision of pedestrian access routes were a feature of traditional Arabic urbanisations. They were the normal means of moving around and, with some similarity to modern transport theory, were sized according to need and use, the most common size being sufficient to allow the passage of two laden camels, about 3.2 metres wide, though narrower sikkak would be found near the end of culs-de-sac where only a pedestrian access was needed. This has changed, as you might expect, but most of the sikkak seem to be residual or accidental and not planned according to need. Nor are they properly treated as can be seen in these two photographs. In the first photograph there seems to be a genuine attempt to form a traditional sikka with a suitable width. Access drain covers have been left raised allowing for the sikka to be finished at a higher level, flush with the drain covers. In the past this has caused problems when the sikka has been left unfinished, and when the level of the adjacent housing has the same finished level as the unfinished sikka. When the sikka has been finished, the new, raised level, is well above the finished level of the housing causing problems with access levels and flooding in the event of unusual rainfalls – a not uncommon problem. In the second photograph there can be seen the usual difficulties when the sikka is left unfinished in a more urban situation than that above. Cabling, accessible electric meters, air-conditioning units at a low level and other obstructions and rubbish contribute to difficulties in using the sikka safely. The standing water is likely to be foul water of some sort unless there is a water leak nearby. All this is exacerbated by the lack of a finished surface being provided to the sikka. Of course I have no reason to believe that this and other sikkak will not be finished, but the amount of work being carried out on new build work, the fact that it is usually expatriates living in these areas, and the resources available to carry out this character of work suggest it will take some time for the authorities to get round to it. These two photographs were taken in the centre of Doha in the latter part of the nineteen seventies. The top photograph is of one of the main routes pedestrians took in walking from the housing on the higher ground south of the centre into the suq. This sikka was one of two that were heavily used throughout the day. The women of the adjoining houses kept the sikkak clean, brushing the surface clear and removing any rubbish – though in those days there was very little litter dropped. Sometimes the sikkak in this area would be refreshed with shell sand. In one part of the sikkak system there were trees in adjacent properties which introduced colour and movement to the sikka as well as a little additional shade, enhancing the experience of walking through the area. There was also a single bridge linking property in joint ownership on different sides of the sikka. Although you can see it was of crude construction its location on a kink in the path created an interesting element within the urban landscape. The construction of coastal houses differed in a number of features from those of the interior. The main visible feature, the walls – hayt or suwr – were built from ordinary limestone desert stones or stones from the sea – hasa bahri – held in juss – a limestone mortar matrix, with a juss protective render and, sometimes, a finish of nuwra – a limewash coat. The juss and nuwra were made on site from the limestone which is a feature of the country. The walls were normally built off rock where this was possible with sites being selected for this purpose. Where this was not possible an excavation for the foundations – assass – would be made approximately a metre wide and 800mm deep and the wall started at this width below ground level, narrowing to its more usual 500-600mm thickness at ground level. The key factor in constructing walls of this form was to ensure that there were no voids in the structure. Great care was taken to make sure that all stones were completely coated in juss as they were located within the wall, and juss was thrown in to all junctions of stones in order to avoid cavities which would weaken the structure. Stones were laid in a herringbone pattern on elevation when the best craftsmanship was practised, but often the stones were laid in a more random pattern, this having to do more with the shape of the stones, and their irregularity. With minimal maintenance on the finish – which protected it from the ingress of rain – it was considered that such a house would last thirty years or more. Although primitive tools were used in the construction of houses, it is possible to see that the walls of many houses were finished literally by hand, giving a lively and attractive texture to the walls in the hard light of the region. Before moving on to look at traditional architecture of the peninsula, there is an intermediate type of development which might illustrate some useful lessons. All over the country there are structures commonly but, perhaps inaccurately, known as barasti which house some of the workforce though they are far more rare nowadays than they were in the last century. Constructed of beaten out oil drums and blockwork, they usually have a clean, swept sand floor and a number of conveniences, often powered by illegal utility connections. In this first example you can see that not only has the structure got a wall mounted air-conditioning unit and external water tank, but it was developed to enclose a date palm and has an external sitting area. The photograph above of the single building was taken between the ‘C’ and ‘D’ ring roads in 2002, the occupants working for an important residence nearby. The first of these photographs, by contrast, was taken much earlier, in March 1976 over one of a large area of such houses which were constructed south of Doha, north of the ‘C’ ring road. Note that they are mainly of pitched roof design, constructed of timber and beaten out oil cans. The second photograph, from August 1976 illustrates a part of another development, this time much farther out of the city, where blockwork houses have been constructed with a mixture of blockwork and beaten metal oil drum walls forming the courtyards. Both of these developments are designed as courtyard housing, the natural solution to housing in this part of the world. In this respect they are similar to the housing that was developed by the Arabs settling in the peninsula. The barasti housing that sat north of the ‘C’ ring road, at the southern extremity of Doha in the early seventies was established by the Municipality as a method of tidying up many of the neighbourhoods where random groupings and number of barasti had developed over a period of time. Taken in March 1972, the first photograph looks at the housing from across the ‘C’ ring road which was in the process of being constructed. You can see a small child from the housing playing on it. The second photograph is a more general shot of the outer buildings and shows them to be a mixture of wooden and beaten out oil drums as well as a couple of houses constructed of tarpaulins or canvas stretched over bamboo canes, an innovation to the peninsula that would have been brought in by the workforce, but which has a passing similarity to the construction of the hawdaj used by the badu. Regrettably I never took any photographs of the interiors of the barasti housing, but I know that their looks from the outside belied their interiors. Inside they were clean and neat even though everything was put together from found materials, though they were beginning to contain some of the consumer durables considered luxuries at that time – radios, televisions and the like. The upper of these two photographs gives an indication of the housing from one of its internal streets. Note the number of Qatari flags flying, a common feature of expatriate housing illustrating a form of loyalty or gratitude to the State that employs them. Occasionally the maroon of the flag was exchanged for green. The lower photograph details the typical construction of the walls, here a mixture of timber frame with oil drum panels but with, in this case, canvas tied down over the pitched roof to create a waterproof building. Within the barasti there were a number of elements which were interesting to the casual viewer, if not novel. The first is shown here and is a typical element to be seen in housing areas, a pigeon house. Keeping pigeons is very popular both in the Indian sub-continent as well as in the peninsula where many will breed them in order to provide quarry for their hawks. There are more familiar forms found both in the Arabian hinterland as well as across the Gulf in Iran, both featuring tall constructions with many holes in them. The flat, box-like structure shown here can be seen in the gardens of a number of houses. While the majority of the barasti was of single storey courtyard housing type, two storey living was not all that unusual as the taller units were able to catch some of the breezes, providing a cooler location to spend the night compared with the lower, enclosed courtyards. It is clear that no serious attempt to enclose the first floor has been made here in order that those sitting or lying there will benefit from the movement of air through the structure. This suggests that the upper floor would be used by men only, and not family. Despite a few examples of two storey units, the majority of the barasti housing was constructed as enclosed rooms with associated courtyards. But there were a small number of housing units that are more typical of nomadic peoples who, by necessity, travel with their housing. I assume these are building forms introduced by the expatriates and normal in the areas from which they have come rather than being typical of those who settled originally in the peninsula. The form of this structure is interesting in that it appears to have been formed by ’arish. I had initially thought that the curved form of the ridge was necessitated by having canes of different lengths, but looking at the photograph carefully it is evident that canes are doubled up in order to create deliberately the curved forms of the building. I assume that the covering would have been as others in the area, of tarpaulins or similar cover tied down to prevent lifting in winds as can be seen in the second photograph. A number of the shelters erected south of Doha in the 1970s were constructed with a more circular plan form than that immediately above and which appear not to have had a ridge line. This photograph shows such a structure where the construction can be glimpsed, the covering being created from a variety of materials added to make the structure watertight. Some of the structures had a significantly dome-like shape to them, but I was never able to see inside them. Housing workers mainly from the Indian sub-continent, the barasti were an economic necessity due to there being, at that time, insufficient housing for the workforce generally. Many of the workers were employed by the Municipality and other government departments and this character of housing replicated not only some of their traditional housing but also that of the peninsula in which they now found themselves. As mentioned above, the barasti may appear to be unsanitary from the outside, but those living there appear to have organised themselves well and, speaking with officials within the Municipality it was apparent that the problems were considered to be more visual than sanitary. Certainly it is not a good idea for young children to play in areas of rubbish, but it is true that those living in the barasti made provision, as can be seen in the lower photograph, for lavatories to be established and used. Not only that but, as many of them worked for government it was common to see government vehicles moving around the barasti dealing with sewerage, water and other requirements. Not all barasti housing was maintained in this manner. Some of the private contractors had expatriate workers on their sites living in less than ideal conditions. This photograph, taken in July 1982, shows that, ten years after the photographs in the rest of this note were constructed, there were more densely packed housing being lived in. While there are water tanks on the right of the photograph supplying clean water, the fact that there are leakages apparent from the inside of the housing suggests that not enough was being done for the workers. Although the barasti might appear on the ground to be chaotic in its layout and the manner in which ground outside each unit was used, you can see from this photograph that there were concrete block markers built to establish the lines for the housing and its servicing roads. The round-headed top of a concrete government marker can just be glimpsed behind the rubbish to the right of the two blockwork markers. It was not just the physical requirements of those living in the barasti that were catered for but, as a group, they provided for their own socio-cultural requirements which obviously centred around their religion. This first photograph shows that a lot of care went into the creation of this masjid serving those living there. This is a large structure bearing in mind the materials from which it was made. It is carefully made and covers a considerably larger space than any of the residential units. The second photograph is also of a masjid although it was taken in February 1976 and not in the same area as the barasti illustrated above. But it is made of similar materials, with the addition of rush matting used for some of the walls. What is interesting about it is that it is small and open to the sky whereas many of the informal areas used for prayer were just marked out on the ground with stones. Obviously there was thought to be benefit from creating a walled enclosure and a more formal marking of the direction of prayer with a mihrab in the qibla wall which, it appears, has the rush matting walls whereas the side walls are of plywood or similar construction material rather than the more common flattened oil drums. The barasti illustrated above were created by expatriate workers from the Indian sub-continent, but there were other and different types of this character of development created within the peninsula. The first photograph was taken at the beach near Umm Said in November 1974 and shows the more primitive huts used by fishermen, though again likely to have come from the Indian sub-continent judging by the clothes of the children in the photograph. The construction is mainly of timber with pitched roofs, but the building on the left is of blockwork without mortar and there is a significant amount of matting used on all buildings. The second photograph, taken in March 1972, is also of housing used by fishermen, but this time on feriq al-Salata, with the port visible in the background. The main structure in the background is an old building that has been adapted, but there is a low, single storey addition in front of it which incorporates planting, suggesting that it has been there some time. The walls appear to include a wide variety of found material, including cardboard – not a waterproof material, but certainly one that would provide a degree of insulation in the hot weather. But it is not just expatriate workers and fishermen who make and live in barasti settlements around the peninsula, in some areas there are badu living in semi-permanent encampments that are constructed of found materials rather than living in their khayaam. Here is a loose settlement in the middle of south of the peninsula, photographed in the early 1970s. These types of construction can’t be as environmentally comfortable as the traditional bayt sha’r, and represent a series of compromises as a nomadic people move towards permanent settlement. The Municipality cleared away most if not all of the barasti developments and some of the workers were moved into commercial residential properties at various degrees of density. But some of those who lived in the first barasti were moved to purpose built concrete block units with concrete roofs. Regrettably I do not have any photographs of them but they had little ventilation and no courtyards associated with them and were, as a consequence, unsuited to traditional living patterns as well as extremely hot in summer. Mud buildings are likely to have been some of the first constructions created in Qatar, although it is possible that ’arish structures may have predated them or, at least, existed coevally. To build them there will have been a source of suitable material at hand, most probably rawdha, a soil suitable for sustaining plants which, when mixed as mud, is known as teen. In some countries mud bricks are fashioned from a mixture of soil and water but with the admixture of a binding material. I don’t recall having seen this in the mud structures I have seen in Qatar, nor is it evident from inspection of the photographs. This first photograph was taken in the north of the peninsula in December 1977 and shows a mud construction on which, perhaps at a later date, a stone gable construction may have been added using random stonework. The building would have had an ’arish roof, utilising sa’af or palm fronds. As it is difficult to produce a completely water resistant roof it is possible that both the gable ends and the top of the mud walls were finished with stones in order to provide a degree of protection to them. It is significant that the bottom of the walls were not protected, a fact which is evident in the photograph where the bottom of the wall has been significantly eroded by rains. Here is a photograph illustrating the most likely form of construction of the roofs of the above types of building construction, whether it was formed of mud or desert stones. Taken in al-Mufjar in 1985, this roof appears to have been a temporary construction of ’arish, the building finished in a traditional material rather than with the flattened out oil drums which were found on many more recent buildings with pitched roofs. Having said that, the roof has been laid to create shade rather than shed water as the ’arish is laid horizontally, suggesting that there are underlying beams spanning from wall to a ridge beam. By contrast with the first structure, in this structure – one of a small number of houses at Imsaimeer, south of Doha – care has been taken to start the construction with a base of stones directly off the desert floor. This has obviously served to protect the mud wall above it from erosion at its base. It also appears that there are a row of stones at the top of the wall intended similarly to protect the wall, as was suggested in the paragraph above, this time for a flat roof. But there are a number of other points of interest that can be illustrated by this building. The first is that the mortar used to bind the mud bricks together has a significant amount of relatively large aggregate in it as can be seen in this detail of the above photograph. While there appear to be few stones in the mud bricks, the use of small aggregate in the mortar is likely to have served as a form of protection to the mud wall, a theory supported by the fact that the mortar can be seen to be projecting from the face of the wall compared with the supported mud bricks and has suffered relatively less by the action of rain and wind. The second photograph, taken of another mud building two years later, illustrates a similar, but more marked, effect. The photograph also illustrates that the exposed corner can be seen, at the top, to be rounded and has been given additional protection resulting in its not having failed and, to a small extent, protected the mud bricks immediately below it. This photograph illustrates in more detail, the principle of protection shown above, albeit at a much smaller scale. In this detail of a mud wall it is possible to see that a number of small stones were present in mud construction and have subsequently been exposed by the attack of wind and water. This exposure has resulted in their protecting the mud immediately below them, resulting in the small-scale stepping apparent in the surface of the wall. The walls of these mud structures were relatively simply fenestrated but it is interesting to note in this example, photographed at Umm Salal Muhammad in May 1980, that there appears to have been no attempt to use an arch to create the opening, but that it has been formed by leaning two orthogonal mud bricks against each other at 45° to create a point to the head of the window opening. There would have been no method of closing these openings. In this photograph, taken at Imsaimeer, south of Doha in December 1977, a similar but slightly rounded arch can be seen, created within the thickness of the wall for storage. But there are two notable features to look at. Firstly, there is a square opening at what would have been ceiling height that would have vented hot air from the top of the space. The second feature is that the top of the mud wall has two or three horizontal layers of hasa on it in order to provide protection at this weak point in the construction. It is a relatively sophisticated structural device, undoubtedly one learned from experience. Here, in 1980, is another interior of a mud construction, this time with squared internal openings created by the use of short lengths of shandal let into the wall to bear the weight of the bricks above them. I assume that the openings to the exterior within the framed device are intentional, although it’s possible that the opening was closed and these frames were intended solely for storage. I can’t say what their purpose is, but believe it may have something to do with the need to bring air movement into the building which is only served otherwise by a single, central entrance. Those using the room would have sat or slept at ground level and would have had some advantage from air brought in at this level. But the presence of the holes at floor level suggest that they are there to allow water to escape that enters through the openings. You can see other examples in the photograph of the ’arish mud house above. This photograph, taken in December 1977 at Imsaimeer, shows that this decaying building had larger windows than those illustrated above. What is particularly noticeable is that the windows are constructed with their cills at or near ground level so that those inside would benefit when sitting on the floor as is usual. Over the side window on the left of the main room there is also a small opening at a high level to ventilate hot air from the internal space. This photograph, taken in May 1980 at Umm Salal Muhammad is interesting as it shows rows of hasa, or desert stones that have been let into the lower part of the wall. As mentioned above, this is a technique which strengthens walls against attack by the combination of rain and wind at their junction with the ground. But in this case I do not understand why the hasa are positioned where they are as they are around half a metre from the external floor level. If you look at the first two photographs above you will see that, in the first, there is considerable erosion at the junction of the wall with the external ground and, in the second, that there is a layer of hasa and no erosion. The only explanation I can think of for this apparent anomaly is that the external ground was considerably higher when the rooms were constructed though, if this is the case, it seems unusual that the mud bricks would have extended down below ground level. There are two final points to make. The first is that there were no closing or sealing devices to the openings of this type of building unless it was possible to take a material that was close at hand and seal the opening. Generally there was little or nothing inside that would be harmed by the ingress of water, which accounts for the openings at ground level where any water entering could run outside. While that may have been a possibility in strong winds or rain, it was a common practice to stuff openings in walls of these buildings with bushes and water them in order to create a primitive cooling device for the air that would pass across them into the room. In this respect these small mud buildings differed from their later, more sophisticated buildings in that they relied on openings at high level to vent hot air from their small volumes, whereas the later buildings, illustrated next, generally utilised tall volumes to mitigate the effects of hot air build-up. As might be expected, the traditional architecture of Qatar is similar in many respects to other Gulf states as well as to the architecture of the Eastern Province of Saudi Arabia. There are also similarities with some of the architecture on the other side of the Gulf, the western seaboard of Iran. Similarity of climate and available materials together with the close socio-cultural links developed over centuries within the region will have been significant factors in the development of common architectural vocabularies. In fact the Bastakia in Dubai is an example of people moving from abroad and introducing their own architecture in order to resolve the environmental conditions they found in their new country. It is also a consideration that master builders were occasionally brought into the peninsula in order to create important buildings. 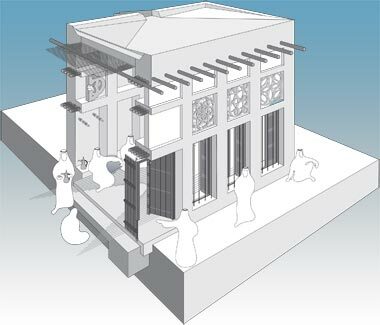 This group of three sketches illustrate a notional building design which has been based on observation of buildings in disrepair and under renovation as well as conversations with builders and craftsmen working on old buildings on a variety of sites in Qatar. It should be seen as an attempt to demonstrate how a majlis or similar structure would have been constructed. The sketches illustrate a number of the traditional design features and constructional methods, and details from them will be used as the basis for comments on this page. Not all traditional buildings would have incorporated all the constructional or design elements included here, nor will all the sizes and proportions be accurate, but they have been added to these sketches in order to flesh out the space and create a semblance of realism, particularly in the internal view below. It is important to note that the sketches are not measured drawings nor the result of drawing an existing old building. The sketches should be seen as the kind of exploratory sketches architects make in their normal work, and may well change with time as research develops more accurate information. In fact it is unlikely that any single building will have been constructed exactly in this manner, and a number of the constructional details are based on issues and decisions that would have differed from builder to builder, as well as with other issues such as location, the availability of materials and labour. One particular point to note is that I have shown the shandal of the roof construction projecting on both sides of the structure. This would not have been so in buildings of any quality where the timbers would have been cut back and not appeared on the face of the building. The basic construction of walls was, as mentioned previously, of a trabeated or column and beam type. When left free-standing the columns had to be relatively robust as can be seen in the photograph to the right where they are fronting a liwan in a relatively sophisticated form demonstrated by the development of the normally square cross section as well as a decorated column head. This form of design can be seen in the Eastern Province of Saudi Arabia and is likely to have been imported from there. This wasn’t the case when they were combined with solid walls. A refinement which developed with time was that the massive structural wall was elaborated into a combination of wall and pier, thus reducing the overall weight of the construction. This process is a normal consequence or characteristic of architectural or engineering design and occurs as builders become increasingly familiar with the characteristics of their constructions. The piers would be spaced about 800-1000mm apart, their dimensions depending upon the number of storeys, the height of the wall and the size of the stones from which they were made. The space created between the piers – rushanih – were used for storage or decorative features. In some buildings they were closed by either panels of juss or, on the coast, by slabs of faruwsh – a form of dead coral which is found in thin, striated bands – to create ventilation systems by offsetting a pair of panels. permitting winds to channel between them. The lower photograph shows a piece of faruwsh lying in the remains of a fallen structure. Note the sea shell fixed in its top left corner. The degree of sophistication described above was generally applied only in the most prestigious rooms of people of standing in the community. The majlis would be the room most likely to be constructed in this manner, but many of the other rooms in a residential complex would have a simpler construction. This generally meant that the ground floor, where the vertical loading would be highest, was more likely to have few openings left in it. In particular, the corners would be left without openings as that area of the structure was relatively weak. Two awtad can be seen let into the walls from which cloaks or other items would be hung. This room would have been built in the same way as described above. Although it is relatively simple it has a degree of sophistication derived from the character of its decoration. The ground floor wall on the right is a relatively strong construction with some openings created within it in order to provide a small degree of storage. It is a simple room with decoration created by the carving of simple geometric patterns directly into the walls. On the left can be seen a qatiya wall, constructed in order to provide a degree of privacy within the overall space of the room. Interestingly the top has been given a decorative treatment which enhances the room. This column and beam principle is used in many parts of traditional structures. The very character of the construction – irregular stones held by a limestone mortar – requires the addition of tensile elements as well as a degree of bracing. In the upper of these two photographs you can see a mangrove pole has been set into and between two columns in order to create a degree of lateral stability to them. This method is often used together with similar poles at right angles to these, bracing the external columns back to the internal wall of the liwan. The second photo shows both the external appearance of the liwan above as well as more recently applied wooden screening which provides a degree of privacy to anybody on the liwan. I don’t remember this on the original building and believe the liwan may have been open then, but this simple form of screening was certainly traditional and a feature on some buildings. While the lower levels of traditional buildings tended to be constructed of solid walls with minimal openings in them, the upper floors were usually of a significantly lighter construction, emphasising the trabeated form of their construction. Here, in a photograph taken in May 1976, is a building in Wakra where the frame has been expressed with the openings detailed for use as windows, a badgheer on the left, and recessed decorative panels with alternating patterns above them. Walls were constructed off a relatively level and solid base, preferably of solid rock but in some cases the foundation was constructed on undisturbed sub-soil, preferably at least 300mm below the finished surface adjacent to the building. The materials of construction were either stones – most common in the desert – but also of faruwsh, the importance of this being that it was a dead material and unlikely to move with time. In some parts of the Gulf live coral was used and, this being subject to moving with time, the structures were reinforced with horizontally placed pieces of wood. In Qatar I have not seen this and assume the reason for it was that it was always faruwsh or desert stones, hasa which were used. Stones from the desert were generally not worked in order to shape them, though some crude cutting of the relatively soft stones may have taken place in order to create a plane face to a building. However, the fact that they were irregularly shaped and sized means that they relied upon the packing of smaller stones and, particularly, juss to bind the stones together and produce a strong and relatively stable structure without the need for horizontal reinforcement. These structures were also covered on the outside with juss in order to protect the structure, a practice which requires constant maintenance in order to give continuing protection to the basic structure. Contrasting with the hasa wall above, here is another wall seen in a house in the north of the peninsula. The stones are selected as well as being worked to create long flat units, well suited to creating a strong wall. I wonder what criteria the masons used in selecting the shapes they did in both walls. I would have thought that the flat hasa would be best suited to high, strong walls and the rounded hasa to relatively low walls. However, the converse is true in these examples. The flat hasa were seen in a boundary wall, the rounded hasa in a tall building at Umm Salal Muhammad. Similar to the example above, but found at Umm Swaijah, this wall construction has two similarities to that of the wall above in the shape of the stones and the amount of voids. The stones are not as flat as those utilised in that wall, but there appears to be an attempt to have alternate rows of stones sloping at alternating angles. The disadvantage of this is that there is a large proportion of voids created by this geometry which can create instability in the wall if the voids are not packed with infill stones and large quantities of juss. This example of a hasa wall construction was seen at al-Mufjar, in the north of the peninsula. Compared with the three examples above, it is evident that the hasa used to construct this wall have been worked to create more regular cross-sections, and that the fit between them, while still requiring the addition of infill stones, has less voids between the stones. If this is true for the interstitial spaces within the wall, then this wall is bound to be a more solid and structurally sound construction. It was not clear to me why this wall had been constructed as it was, particularly as I was told there would be no finishing juss to its face, nor was there to be any material pushed into the interstices between the stones. The wall was constructed as a privacy or security construction and was not part of a room where a more substantial construction would have been required. Nevertheless it was possible to see between the stones, though this appeared to be of little or no concern. Generally privacy and security walls were finished with at least juss mortar, if not a facing layer to strengthen the walls and give privacy. This wall section is also taken from Umm Salal Muhammad where it part of a relatively tall construction. There are two things to notice here. Firstly, the size of the stones are relatively small, indicating that there were few large stones available for this building which, in turn, suggests that it may not have been regarded as such an important building. The second point, however, is that although care has been taken to fill the interior of the wall with smaller stones, it appears that juss has not been used to fill the spaces around all the stones, thus producing a relatively weak structure. Solid walls are strong only in the degree to which there are no voids within them. Contrasting with the construction above, here is an example of a very heavy wall where the internal packing can be seen. Here there is evidence that the problems associated with internal voids has been recognised and approached more consistently. There are a range of small hasa inserted to fill voids, however the method of placing the larger hasa without a juss bedding has left a considerable number of voids in the construction, leading to weakening of the wall. It is not difficult to see how walls can be built with inherent weaknesses. This photograph, taken in 1972 shows the construction of part of Sheikh Abdullah bin Jassim’s development when it was reconstructed as the Qatar National Museum. Here the wall can be seen to be constructed with neither large nor small stones and with a cement mortar used for binding the wall. While a string is used to set out the wall in plan and maintain a degree of control on height, the cement mortar is not the best material to use with the soft limestone hasa. There was no control of individual batches, nor was there any control of the sun on drying out the cement. Following the placing of the hasa, as can be seen in the lower photograph, a layer of cement was placed over them as well as to their sides creating at least some semblance of integrity over the stones but not too much under the next layer which, in consequence, was not properly bedded. The construction is awaiting a finishing coat. I must have mentioned it elsewhere, but the difficulty masons had in constructing strong walls in Qatar was their general inability to bond stones together. Regular bricks and blocks create stable walls by their mutual, mechanical relationships. It is particularly important at corners where there is the need to strengthen the construction. Here the corner has been accurately made and the wall will be relatively strong because of it. Many Qatari buildings have their corners rounded in order to provide a strong structure, and fortified buildings invariably have rounded and buttressed corners to protect their structural integrity in case of attack. Compare the corners of the wall illustrated above, with that shown here. In this case stones have been selected that are relatively orthogonal and have been used to create a more accurate right-angled corner. However, the problem remains where it has not been possible to bond the stones on the corner to those adjacent to them. The corner on the right is still standing, but that on the left has begun to fail from the top. The second photograph, taken of the back of the structure, illustrates a little more of the way in which this structure is failing. You can see that the walls have been constructed in the traditional manner, with an internal and external leaf, but with no through stones, stones that bond the inside leaf to the outside. As noted below, this creates holes within the wall which create weakness. Failure has meant that the outside leaf has peeled away and fallen. The reason for the wall’s failure is interesting. The walls have very little finishing juss to protect them. The roof, however, has been traditionally finished with covering layers of protection that have been carried over the top of the wall and down to shandal level. However, the effects of weather have weakened the roof at one end of the building and, with the absence of protection, the structure is failing from the top. Compare the above with this which is another dramatic illustration of the problem created when walls are constructed from irregular desert stones. The inability to bond the junction of the two adjacent walls has caused them to fail in a precise demonstration of the corner’s lack of structural integrity. It is interesting to see that the stones forming the internal face of the room remain, showing that the wall is built of an internal and external facing of stones with an infilling of smaller stones included in order to avoid spaces within the structure that would create weaknesses. Moreover, it is notable that there is a lack of through stones that would bind the internal and external faces together, improving structural integrity. In this case, the rains have caused difficulties at the foot of the wall, washing away its protection and creating this pattern of failure. Here is an example of a rounded corner on a two storey building in Doha, this photograph shows the ground floor supporting a badgheer at first floor level. The whole structure appears to be missing a final coat of juss so it is possible to see how the first floor corner is supported by cantilevered wooden beams. However, the structural design is curious. Note that the beams are larger than mangrove poles but also appear not to be squared off which suggests a different timber, perhaps palm tree. The technique of rounding the walls at ground floor level helps to strengthen the corner but, as a notable feature, the first floor is also rounded leaving just the floor construction expressed as a right-angled element of the construction. Examination of the photograph suggests that this band is constructed of faruwsh. The photograph was taken in the late nineteen seventies and my impression is that work on completing the construction was delayed and the building left uncompleted. It is unusual to see large quantities of faruwsh being used but here is a detail of a wall in the north of the country illustrating its character. There were a number of reasons for using this material in building construction. Basically, the material is dead coral. It is lighter in weight than desert hasa, its form, due to its striated character, makes it suitable for building bonded and, therefore, more stable walls, it is more insulative than desert hasa and, adjacent to the coast, it was readily available for the construction of littoral developments. Having said that, it is rare to find it used in quantity. Because of its insulating character its environmental response doesn’t work in the same way as does that of walls built of hasa which rely upon the relatively slow heat gain through the day and the release of heat during the night. Walls of faruwsh have a slower and smaller response that, theoretically, would suggest a different form of building. However, I know little about this and would be grateful for any information on it. What would be significant is the heavy saline content of such walls and, presumably, their juss mortar which would have been most likely manufactured using sea water. Note, in this wall, the extensive deterioration of the mortar compared with the hasa walls constructed in the desert above. This detail from the above photograph shows pieces of the faruwsh. They are approximately 300mm across and about 60mm high. Note the irregular texture of the stones which suits the adhesion of mortar but, ironically, the lack of juss as has been mentioned above, but the apparent use of suban for the juss mortar. The use of suban is interesting as it will have brought additional insulative quality to the wall. It was also a very common material on beaches throughout the country and, perhaps, would have been more available to the builders than might have been ordinary sand from the desert. This photograph was also taken around the same time as that of the rounded corner building above in Al Wakra and shows a building whose external surfaces have been finished. It was, however, abandoned and, as can be seen at the top of the building, there is evidence of the beginnings of failure at least of the juss, but more probably of the underlying masonry construction above the curved element of the corner masonry. The failure of the squared masonry corner at roof level is understandable, as explained above due both to the lack of bonding at the corner as well as its exposure to the elements. While massive stone walls strengthened fortified buildings at ground floor level, there were refinements made which created additional stability in all structures. In order to strengthen the walls between columns where the construction was lightened in weight as illustrated above and here to the right, mangrove poles were introduced horizontally linking the columns within the structure which had the effect of improving both lateral and tensile stability. Bonding to the stones and juss was enhanced by binding the poles with hemp rope – kumbar – which technique also improved the distance span of mangrove poles. The upper photograph to the right was taken at a building under reconstruction in Wakra; the lower photograph is of a building in the desert in the north of the country. This photograph illustrates the end of the first floor of an old building undergoing reconstruction. It clearly shows two factors discussed previously: the first is the use of mangrove poles to form the structural bridge between columns, the second, the structural system. You can clearly see how they were used in groups of, in this case, three, bound with hemp rope both to keep the poles together as well as assist in helping the juss mortar to bond the stones to the poles. But perhaps the more remarkable point to note is the slenderness of the columns. Bearing in mind that the building is constructed of irregular stones you might anticipate a heavier cross-section for the columns. The fact that they are relatively narrow implies that the building is the result of long development with the master builder certain of his skills in ensuring structural integrity. Looking at the end wall it appears that the horizontal mangrove poles are not continuous across the width of the building. To make them continuous would be one way of obtaining optimal structural strength and was a feature of wall construction in some parts of Saudi Arabia. It makes sense to have continuity when the columns are narrow as, without it, there would be the possibility of a lack of sufficient bearing of their ends on the columns. Where I have been able to observe it mangrove poles used as lintols were separate for each opening, but I have a suspicion that, in this case, there would be a good argument for making them continuous along the long walls of the room. Further down the page there is a note on doors which includes this detail of an entrance door in the centre of old Doha. The decorative detail, part of a naqsh plastered arch, illustrates something of the simple character of the architecture and its detailing in Qatar. The arch and its decoration have been constructed geometrically and would have been relatively easy to set out and construct, creating a relatively sharp and clear detail. But the capitals, the top of which can be just glimpsed, show a more imaginative and foreign style. Here, by contrast, is an interesting illustration of another arch, this time not from Qatar but from Hofuf in the eastern region of Saudi Arabia. The reason I have placed it here is not only for comparison of its cursive style with the more plain, geometric style of the Qatari arch above, but also because it represents something of the architecture of the hinterland from which there is some influence in Qatar. It shows a more playful approach to detailing with less geometric formality and a certain amount of invention. The arch above is in an old part of Hofuf which is being demolished, this photo illustrating the character of the architecture. Although there are elements such as the badgheer which are similar to Qatari architecture, the tall arches are rarely found in Qatar. It appears that the arched construction may have been a result of the use of arches to span wall openings rather than introducing timber to span as beams in a trabeated form of construction. This might be a result either of the shortage and, therefore, expense of timber to use in the construction of lintols, or the need to provide relatively small openings either for defensive or for environmental control purposes. In Qatar, the trabeated form of construction is very common, particularly along the coastal developments where environmental conditions and, therefore, their treatment, are different from the interior. Having said that arches are rarely found in Qatar, here is an illustration of an old building in Umm Salal Muhammad in the heart of the Qatar peninsula demonstrating the use of a similar construction to that in Hofuf. The buildings are relatively old and demonstrate a defensive character to this development which is adjacent to a well and agricultural area. The arches are of a similar, if not taller, height than those in Hofuf, and Umm Salal Muhammad is some way from the coast. It appears that there is a strong architectural connection with the buildings of the eastern province of Saudi Arabia, particularly away from the Qatari littoral. Earlier, buttressing was noted in the context of the strengthening of corners. It is also a feature of fortified buildings where the base of the walls and towers needs to be given additional protection against attack. Sometimes this strengthening is carried out by battering the whole of the wall and this is feature of many tall buildings such as those at Umm Salal Muhammad, seen in the photograph above. But, here in a photograph taken in 1972 at the old residential development of Sheikh Abdullah bin Jassim at feriq al-Salata, the ground floor wall of one of the buildings, part of which has fallen away, can be seen to have been buttressed in order to safeguard it, not against attack as it is protected by being located within the compound, but against the loads imposed on it by the tall structure resting on it. Although the arch – qamr or qaws – is considered to be a particular characteristic of the architecture of the region, the standard building form is of a trabeated, or column – a’amoud – and beam – jisr, construction. Arches, where they are used in traditional construction, are nearly always an applied, non-structural feature and are not integral to the construction as they are in some parts of the Arab world. Normally the arch is semi-circular, but the pointed and ogee, perhaps introduced via Iran from the Indian sub-continent, are also found in Qatar. The photograph above shows a trabeated construction in Doha in 1988 forming an iwan to a small domestic courtyard. It was taken in 1988 as the old housing was being demolished in order to accommodate the reconstruction planned for the centre. The photograph clearly shows the traditional form of trabeated construction common to the area. In this photograph, taken in a small village near Riyadh in 1981, the column and beam construction is clearly articulated, the heavy beam taking the mangrove pole roof construction. The next two photographs illustrate more of this type of construction. The upper shows three mangrove poles, laid horizontally to each other, and wrapped in kumbar to strengthen them supporting a masonry construction. The door frame acts as a lintol to support a part of the masonry load. On top of the mangrove poles are layers of hasa, desert stones bonded and faced with a juss mortar and render. Here, the foot of a column illustrates the problem faced by the builders. The hasa have been dressed to form relatively square units, but there has been no attempt to create a bond between successive layers. Their integrity rests solely in their ability to take the direct vertical loads created by the rest of the column and the roof or floor structures above. This requires the packing of the column in order to avoid voids. It is also the reason why it is common to see mangrove poles incorporated in the upper half of the columns in order to provide additional bracing to the columns. These next two photographs illustrate a similar principle relating to the stabilising of tall columns. The first is of an old building at Wakra, photographed in 1973, the second of part of the main building in the palace complex of Sheikh Abdullah bin Jassim at feriq al-Salta, taken in 1972. the mangrove poles have been added at the height of the springing of the arches in order to help stabilise the column and beam structure. The arches have no structural rationale but are here for aesthetic reasons. In creating tall structures for micro-climatic purposes there were significant problems in constructing tall columns which maintained their structural integrity. What developed in the design of columns in response to this problem was that the columns were thickened where possible and braced both with mangrove poles as well as arch elements. These, while having no structural integrity with regard to transferring vertical loads, created lateral support to the tops of the columns. The lower photograph clearly illustrates how the columns were thickened at the base and braced at their heads, as such, a refinement of the heavier system illustrated in the photograph above it. 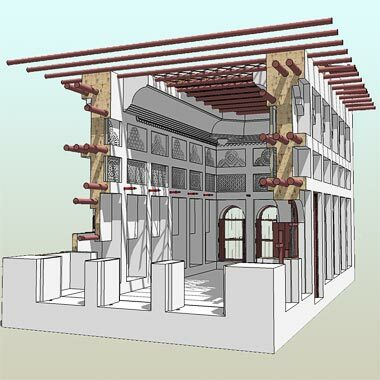 The method of constructing columns creates the typical arrangement of solid to voids characteristic of Qatari architecture. In this first floor arrangement at Wakra, the pattern can be seen to have reached the limit of its builders skills at utilising the materials at their disposal. Again, arches have been used to complete the openings, softening the trabeated construction and producing an aesthetically pleasing architecture while taking advantage of the views over the littoral and sea as well as the breezes associated with the diurnal weather patterns. Notice that these openings take up around half the height of the rooms, there being mangrove poles inserted horizontally above the arches in order to help strengthen the wall construction. The illustrations above show something of the usual way in which trabeated construction was deal with in the peninsula. It represents the pinnacle of achievement of Qatari master builders working, in this case, in Wakra. The construction is column and beam, but the area within these elements has been filled in and a semi-circular arch formed. At the same time as this work was being carried out, other builders were creating another typical design form. Here, in the old palace complex of Sheikh Abdullah bin Jassim on feriq al-Salata, there is an earlier version of infill, allied with a pointed arch feature which, again, is not a structural element but is used as an infill spandrel panel between columns and beams. Note that the narrow vertical feature on the face of the columns is taken up to the level of the beam. The example above would have been an expensive way of designing at the time but, as it was constructed for the leader of the country, it is not surprising. The more mundane constructions expressed the simpler trabeated constructions where there was less opportunity to decorate but where the heads of the columns and the columns themselves developed a different character. This is likely to have come about by the use of different materials from those traditionally used. In this first photograph, taken in Duhail in 1982, the colonnade of the iwan is composed of columns of octagonal cross section and with a relatively high slenderness ratio – height to width ratio – possibly because they are constructed in a form of concrete. With this slenderness and un-buttressed height it is unlikely that these columns could have been formed of the traditional desert hasa. This pair of photographs are external and internal details of the head of one of the columns in the photograph above. They illustrate clearly that the beams are made of the traditional mangrove poles and show that the decorative feature is not intended as a structural element. It is doubtful if there would be any significant support given by the decorative device, though it may contribute a marginal strengthening of the junction of column and beam. The important point to note here is that the design feature shown above is still being used, albeit in simplified form. For some time the photographs have created a problem for me as I have not been able to give a local name to this feature. Generally people seem to refer to it as a muqarnas. However, my understanding has always been that the muqarnas is the name given to the three-dimensional forms associated with the squinch corners supporting domes. What is striking about these details within the peninsula is that they are, in essence, two dimensional in form. However, I now believe the feature is referred to as a sintiwaan – there being an apparent reference to an iwaan – although in my many years in Qatar I never heard this name. A complicating problem is that some Arab architects and workmen I have spoken with suggest that it should not be seen as a structural or non-structural two-dimensional element, but surfaces upon which a design is made. They refer to this as naquwsh, which essentially means an inscribed or modelled design, a word that is obviously related to naqsh. But the characteristic of this feature in traditional Qatari architecture is that it is two-dimensional and undecorated. In the example above the decoration occupies approximately a third of the clear distance between columns leaving a third of the distance open at the top. This example, part of a reconstruction at Rayyan, shows that the decoration has been reserved to a much smaller element of the clear span, each occupying approximately a fifth of the clear span, leaving around three-fifths clear. This is a different example, and is very similar to that above in the selection and deployment of simple geometric shapes to create a decorative panel. Its difference is that it appears to be almost an upside-down version of the panels in the photograph above. The pair of them can probably be seen as representing the more normal examples of this decorative element found in traditional buildings all over the peninsula. This example of decorated infill was photographed on the iwaan of the masjid at Umm Salal Muhammad in 1986, but now demolished. It is slightly more complex than those above, almost displaying a symmetry about the junction of the column and beam. The second photograph illustrates more strikingly the power of these simple details when seen in numbers. It shows how the elevation of the column head has been refined in order to produce a more elegant solution, particularly when it is associated with the decorative infill panel that is commonly used on trabeated constructions both on domestic as well as religious buildings. Bear in mind that not only are these two-dimensional patterns, but that they only are applied in one direction. There is also an ambiguity in certain situations. For instance, it is possible to read the decorative infill panels either as infill between column and beam, or as column capitals – obviously, the smaller the decorative element, the more like a capital it becomes. While this latter point is true for the older traditional masaajid in the peninsula, newer buildings – in the lower example here, the masjid reconstructed in suq Waqf, Doha – the structure is reinforced concrete, the beams spanning in both directions from the columns and the junction decoration applied both ways, creating the semblance of trees. My guess would be that these details began as relatively simple elements, perhaps with the vertical dimension longer than the horizontal as a reflection of the ease with which it would be constructed and held in place. This example is the simplest version I have seen. Although it bears similarities to the others in this note, it is strikingly different in the particular pairing of the curved and slotted elements of the pattern. While all the examples above show decorative treatments derived in the main from cursive geometry, here is an example where a strong rectangular element has been introduced into the detail. I have no idea how this might have developed historically or geographically, but it creates a more modern feeling to the detail, and one which appears to be moving away from the general style of traditional architecture where cursive details act as foils to the orthogonal geometry of the buildings. Here is an example of a similar treatment, this time having no cursive element at all, and appearing Western in its appearance. Taken in the wind tower development in the centre of Doha in 1975, it illustrates how a design route has been taken to reduce the amount of material in the column, visually lightening the appearance of the column, an effect enhanced by the introduction of simple rebates at the junctions of horizontal and vertical planes. Curiously, this detailing seems quite refined, in considerable contrast to the orthogonal decorative infill device. As an aside, and in something of a similar manner to that above, and with far heavier columns, the builder of the masjid at al-Dhakhira has taken the opportunity to lighten the massive construction of the columns by reducing their cross sections at the higher levels. Photographed in 1986, it may have been that the junction from heavy to light should have been in a different place. Lowering it would have improved the lighter feeling of the upper elements. These next two photographs illustrate a similar feature of the traditional architectural vocabulary of the peninsula, and were taken of masaajid at, respectively, Wakra and al-Khor in the late 1970s. In the first example the structure and decoration can be seen to be almost identical to that at the masjid above at al-Dhakhira, but the detailing between the sintiwaanaat is not as decorative and, particularly, the design of the nearest sintiwaan is significantly different from the others, which are all alike. Here, by contrast, is a view of the iwaan at a masjid in al-Khor. The detailing is simpler, the sintiwaanaat have the same detailing, and the proportions of the columns and sintiwaanaat are more related to trabeated construction than that above at Wakra, the latter beginning to resemble a decorative arched construction as the sintiwaanaat almost meet at their connection with the beam. This photograph, taken in Rayyan in 1986, shows what was intended to be a minimal insertion of features in the refurbishment of an existing building. It is evident that there has been a logical improvement at the corner of the verandah which shows that the refining of the column head works well where it has to turn a corner. There are always difficulties in refurbishing buildings when there is a larger workforce from which to draw craftsmen and more funds and time available. The temptation exists in both the building owners and the craftsmen to embellish more than was there originally. While many of the elements of the refurbishment remain relatively true to the original, the amount of naqsh has increased significantly. But embellishment is not only the result of too much detail, it may also be a result of more considered detailing, as may be argued in this well thought out example. By contrast with many of the examples above, the treatment of the spandrel insertions on both the façade of the iwan of the masjid at al-Dhakhira – also photographed in 1986 – as well as its internal columnar structure, spans the whole of the distance between the columns. The detail of the double semi-circular features at its centre indicates that there is no structural necessity or intent – it is impossible to know what was in the mind of the master builder of the masjid. Had there been, then it would anticipated that there would be a single keystone element featured at the centre of the space between the columns. In fact the beam has been visually weakened by the design recessing the two semi-circular features. Where the opening is very narrow, as here, at the top of the openings at the head of the wind tower in Doha, also photographed in 1986, the spandrel pattern works well as a form of decorative arch. Design decisions can often be difficult and take considerable time to make, sometimes out of proportion to the eventually achieved effect. In this case there would have been a number of alternatives to the final decision. Here, the central opening is a little wider than the two flanking openings but the same spandrel unit has been used suggesting that prefabrication was more important than having the same width of junction at the top meeting points of the two spandrels. Generally, the decoration of openings discussed above relates to the wider openings common to iwaanaat and the internal structures of musalliaat. But much of the decoration of traditional building structures has been associated with domestic housing and the larger scale buildings used by merchants. This is the area where the applied decoration commonly sees a variety of arches added to the narrower trabeated constructions of walls. This sketch illustrates some of the arch shapes found on buildings in the peninsula, mainly in Wakra, Doha and Rayyan. They are not drawn to the same scales as the originals. This first photograph is of the west-facing façades at Wakra shows the simple treatment of semicircular headed arches. Whatever the scale of these buildings, the structural framework governing the size of their internal spaces and their openings were similar, being related to the effective span of mangrove poles, the slenderness ratio of walls and columns constructed of hasa and juss, and the restriction on expensive construction elements such as timber for doors and shutters. The second photograph also illustrates a simple arched form, this time pointed arches. In both examples the building only displays a single form of arch, later developments often mixing two types, usually in an alternating manner. This is different from the rules governing the disposition of naqsh panels within rooms. These two examples show the simplest forms of arched treatment commonly found decorating traditional buildings. It is not suggested that the design of arches can be used to date, either literally or relatively, the design or construction of specific buildings, though it is probable that the simpler designs might be ascribed to earlier buildings. However, it is also possible that the character or extent of decoration might relate to a number of factors including, but not limited to, religious influence in the area, social standing, geography, experience and origin of the master builder, length of settlement or wealth of the population. This next photograph is of the north end of the public majlis, which forms a part of the complex constructed around the end of the nineteenth or beginning of the twentieth century for Sheikh Abdullah bin Jassim at feriq al-Salata. Here the upper band of decorative panels has a series of arches designed in a trefoil pattern, one which can be seen used as a design motif on buildings all over the peninsula. Here it forms the shape both of the blind panels as well as the frame for the upper naqsh panel over the central entrance door. The lower photograph is of another building in the same complex and is probably contemporary with the building shown above. Here, however, the craftsmen have relieved the regular pattern by introducing a different detail which has an element of the ogee arch but also a small, broken step of a scale which does not match the detailing of the building in general, or the other arch in particular. In a similar treatment to that relatively simple one here are similar details on two different buildings, the first photographed in Wakra in 1976, the second in Doha, 1981. The two different treatments of arch both incorporate a stepped feature, the shoulders of the steps being around the same size, but with the ogee element relatively large due to the semicircular element having a part of the step at each side. Nevertheless, the balance between the two different forms of panel is more even compared with that at al-Salata immediately above where the shoulders of the ogee arch seem too small, and the point of the ogee is, obviously, sharp compared with the generous shape of the semicircle. This pattern of arches, both in delineation and juxtaposition, is one that was found all over the peninsula and can be thought to be characteristic of Qatari architecture. Note that the arch types alternate here compared with the examples in the paragraph above. It is interesting to see that, in other urban centres of the peninsula, different styles of treatment were developed in the creation of decorative arches. This photograph was taken on the first floor roof terrace of an old building in the centre of Doha, where this room was most recently used as a storage room. Some trouble has been taken in the detailing of the infill panels with the alternating panel treatment being similar to that found elsewhere, but with the detailing of the ogee panel differing from that shown on the photograph above it. Because the panels alternate, the door over-panel does not fit into the rhythm of those panels, though it is treated in a similar manner to the ogee panels, creating an extremely unusual bell-shaped opening. A more sophisticated treatment might have been to create a design for the opening which would be different from the other two arches. The third of these three photographs gives a relatively accurate image of this unusually described bell ogee arch over the door. The shape is likely to have come from the Indian sub-continent rather than from the Arabian hinterland, but what is particularly interesting is the way in which the curved corners of the arch meet the horizontal at such a small angle. The running design over the arch is very much a Qatari detail. Meanwhile, in Wakra, a number of smaller and more subtle details were being developed, though it is also a fact that ogee and other arches were being constructed there too. In this first photograph, of a first floor room at Wakra, the west-facing façade has three types of arch, symmetrically arranged around the central panel. On the right, the south-facing façade has two different treatments, only one of them the same as any of those on the west façade. The inverted V breaks in the heads of two of the arches makes them similar to the ogee arch, but why this has developed in this way is impossible to say, particularly as the ogee was being used at the same time both in this building as well as ones nearby. The small fan-shaped insertion at the top of the arch on the two outer panels is an interesting invention and seems counter-intuitive. This fascination with small-scale work appears on a number of buildings as the lower photograph – on a different building in Wakra – illustrates. This detail is not one which can be read at any distance, though it is true that it is more likely to be readable in the strong sunlight of the region. Having said that, the lowest of these three details has a very different treatment of its head, and can certainly be read at a distance. One odd aspect of its construction is its lack of geometric integrity when compared with some of the other arches. The work on all these arches will have been carried out in-situin juss, and the work is likely to have had to have been rapid. But this does not seem to account for, in this case, the inaccuracies in the setting out of the haunches of the arch. As mentioned above, Wakra was the source of many of the more interesting decorative patterns, particularly a number featuring the use of ogee arches. These three photographs show two patterns used in the same building complex in Wakra and were photographed in the late 1970s. The first is of a decorative plaster insert into the central opening in a qatiya wall used to screen the washing area of a room. This design does not see to be a true ogee design as the central feature appears to be more of a break than an integral element of the curve. This stands in contrast to these next two examples which are basically the same pattern. Here the central feature is very much an element of the cursive line forming the outline of the pattern. The first of these patterns was used to frame what is, in effect, a decorative naqsh work acting as a mushrabiya for the space behind it. The second example is a much more lively design and is used on the wall of a room and frames a watad. There has been an attempt to inscribe a line around the pattern, though for reasons unknown it is neither continuous nor accurate at the head. While these two examples illustrate a design which is not, strictly speaking, an arch, they do occur frequently in positions which replicate or are the same as those where arches are traditionally used. The upper example is the more common one and is used here to create the setting for a piece of decorative naqsh carving. A slightly more complex form of this shape has also been used on other panels including badgheer arrangements in Doha. The lower example shows how the pattern has been used to enliven a simple frame within the corner panelling of a traditional majlis. The owner has taken the trouble to use red and green colour to create additional interest in the wall treatment, an unusual thing to do as it tends to exaggerate all the irregularities which are common to the use of naqsh plasterwork. As mentioned above, nearly all, if not all of the traditional constructions in the peninsula were effected using trabeated constructions. Arches, where they occur create a softening of the more rigid horizontal and vertical lines of traditional structure and are likely to have developed for aesthetic reasons. However, and for the record, an attempt was made in 1985 to incorporate functional load-bearing structures into a building in the Senior Staff Housing Project of the New District of Doha. These three photographs illustrate something of the nature of this type of construction which was traditionally used in other parts of the Arab world for centuries. The architect for this project was Egyptian and, using his experience as a student of Ramses Wisa Wasf, the construction was relatively simple. Arches are constructed of concrete blocks on the perimeter of a square around 3.8 metres a side and then squinches are formed at their junction leading to the construction of a full dome to cover the square plan. In the lower of the three photographs a temporary prop can be seen creating a certain assurance against failure of the squinch, but the blocks here are in compression and, in theory, will hold themselves without the need for a prop. This method of construction was used originally to create barrel-vaulted ceilings, and construction which developed into the dome character seen here. There is an earlier note commenting on one of the most common decorative features of traditional Qatari architecture. It states that I am unsure of the name given to this particular feature, the problem being that many refer to it as being a muqarnas, but this is generally an architectural term given to a structural device used when it is necessary to move from a square plan to a curved dome. The muqarnas is, in effect, a series of corbels and, as such, is structural. But it can also take a decorative form, in which case it is a less honest demonstration of the underlying structure implying, as it does, a structural purpose. In this it is different from the patterns created by the application of tiles or naqsh panels where it is evident that there is no structural implication in the designs. 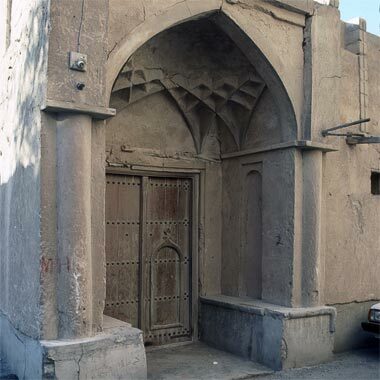 This example of traditional Qatari architecture is the entrance to an old palace, probably constructed in the 1950s and photographed in February 1986. The entrance shows many of the characteristics of an up-market entrance of that time, but the covering porch and its treatment is what distinguishes it from many others. While the attached columns resting on the dikka which serves as a formal base to the column, are strong and simple in their detailing, the decorative features on the soffit of the porch bring a refinement that contrasts with the general design of the entrance. Apparently based on sixteen-point geometry, it is difficult to tell if the design was completed or, if it was, if there was a subsequent change to the top of the porch resulting in its plain finish. It might have been anticipated that the decorative ribs might cover the whole of the vault. Certainly there appears to have been an arbitrary decision to leave the top of the design incomplete. The evidence for this is the detailing at the top of the ribs, seen in both the upper and lower photographs. At first I thought that the two long ribs were apparently constructed to meet in the centre and that central portion has broken away as can be seen in the second, detail, photograph. But I now incline to the view that the ribs were not designed to meet but to form diamonds similar to the three each side of the centre. The design has its detailing in the lower part of the volume and it is not clear if there was ever any decoration, such as paint, applied to bring out the design. Most likely it would have been self-coloured juss with neither paint nor tiles added. The design is likely to have been brought over from the other side of the Gulf, or through Bahrain where that influence was strong. The ribbing may have looked more coherent when first carried out, but time has blurred its design cohesion. But the overall impression is that the work was never fully complete and was abandoned prior to completion. As for the construction, this appears to have effected by using wood or cane to form the outer edge of the ribs with juss being applied in two stages – as can be seen by the detailed photo above – to create the three-dimensional elements of the design. Walls are finished with juss render, the same material that is used to bond stones together. The production of juss differs from site to site but is manufactured by burning limestone or chalk – the peninsula is made of it – a process which produces quicklime or calcium oxide. The residue is crushed and then mixing with water, the process being known as slaking, and producing calcium hydroxide. This material is workable for some time as the process of hardening is a chemical one whereby carbon dioxide reacts with the calcium hydroxide to produce calcium carbonate. While this sounds relatively straightforward, the practice is anything but as it differs from site to site dependent upon the material available, the methods used and quality control, all of which are widely variable. There are problems with the admixture of sand which, if it is taken from the coast will have a saline content as might water sourced from wells near the coast where saline inundation of fresh water is common. Regrettably, I have never seen juss prepared and used on site in Qatar, though I have in England when this was still a relatively common practice. The probability is that in Qatar the juss mortar was prepared from fresh quicklime by slaking with a relatively small quantity of water, adding sand, screening out any unslaked quicklime and then mixed with sufficient water to produce a workable material and applied immediately. The stones of walls were placed and fixed using juss mortar, the same or a similarly mixed material being applied to the finished wall as a render, usually by hand as can be seen in these three photographs. The purpose of this base coat was both to provide a complete, coherent finish protecting the structural material of the wall as well as creating a relatively level finish in preparation for any finishing coats that were to come. In simple developments, this base coat would often be the finished coat itself, finger marks being evidence of the speed and character of the application as can be seen in the middle of these three photographs where there is also evidence of structural cracking above the central arch, the possibility being that there is no reinforcement above it. It seems evident that the process of finishing a wall was considered to be only a necessary operation, one which did not require any artistic interpretation. In the lower photograph finger marks can again be seen as evidence of the manner of finishing the wall, but a piece of wood will have been necessary to ensure a relatively sharp vertical edge to the work, which leads to the question of why this wasn’t used to smooth the wall. Cement mortar has been used to repair cracks in the wall, but again with no great concern for the look of the finished work. Here, in a 1972 photograph of a wall at Umm Swaijah, the finger marks on the wall are even more pronounced. The juss mortar must have been extremely wet in order to obtain this level of marking on the wall together with the rounding of detail around the hasa on the left. There is an element of fun about the wall surface, the decoration suggesting that the person who applied the juss mortar is likely to have enjoyed the process, and might have retained a degree of pride in his handiwork. In urban settlements, however, care was usually taken to create a better effect, usually with the mechanical aid of pieces of wood to work and level the surface to a smooth finish. Here you can see that up to three finishing layers were used to build up a three-dimensional effect on the surface of the building, a relatively small difference in planes being able to create a strong effect under the sun experienced in the peninsula. In the use of modern lime renders it is common to ensure that based coats are thoroughly dried out in order to prevent cracking of the top coat. Here there appears to be some cracking of the top coat, though little evidence of it in the lower coat. Admittedly this is an old building in disrepair, the photograph having been taken around 1980, but it does illustrate the relative longevity of this material under extremely harsh conditions. Builders have told me that a building is anticipated to require no serious work for thirty years if constructed well, but it is evident from inspecting buildings that many were not well built, the most common problem being leaving voids within the construction. It is also evident in this example that there appears to be no scratching or pricking of base coats to provide a key for subsequent coats. It is likely that the process of finishing walls with a number of coats was carried out as a continuous operation, with no waiting between coats for each to dry out. Depending on which part of the year the work was applied, there is likely to have been a significant difference in the way in which the coats would behave. This is particularly true for modern cement mortars but I do not know how this would translate to lime mortars. But, in common with cement mortars, there would have been a problem with working up the surface, a process which brings the finer particles to the surface creating the conditions which encourage surface cracking. This may be the cause of the cracking of the panel in the left of the photograph above. In addition to the manner in which lintols were dealt with over window and door openings, a device to reduce the span of the mangrove beams also produced another architectural characteristic of these buildings. The top of the walls within rooms were developed to cantilever internally. The design effect of this was to produce a heavily modelled coving effect, in some examples decorated, an embellishment which not only permits a wider room span, but which forms a satisfying aesthetic termination of the wall at ceiling level. In the upper of these two photographs the cantilever is minimal, consisting of three projections of worked juss which, while reducing the span of the ceiling joist a minimal amount, still produce a refined ending of the wall of some aesthetic consequence. In the lower photograph, the coving is more substantial and reduces the span by about 200mm on each side of the room, effectively permitting a wider room below, assuming that there is a finite length to the span of mangrove poles. The coving is constructed of massed juss, and there usually is no reinforcement in it. This would require substantial integrity in its connection with the wall though, being constructed around the ceiling joists, this would have provided some assistance in holding it in place. This photograph, which was taken in Wakra in the mid-seventies, together with the two sketches below it, show a more developed form of ceiling coving than those above. They demonstrate not only how the corners were reinforced structurally, but how effective the cantilever can be in reducing the span of the mangrove pole beams, and in transferring the weight of the roof and its construction, onto the walls. Internally the walls were usually strengthened at their corners by the incorporation of diagonally located mangrove poles, a necessity where there is no bonding possibility with the hasa construction. Incidentally, in the lower sketch I have shown the corners of the masonry wall structure here as being finished at right angles rather than rounded as is shown in the next photograph, below the sketches. In the photograph above you can see, to the right, that two poles have been inserted on top of the wall construction – one at the top and one at the bottom of the coved cornice – with hasa being taken across them to turn the corner, and then juss packed in both to consolidate the stones as well as being worked to produce the finished moulding for the cornice. These two sketches below the photo are a theoretical illustration of how this was carried out. The wall and roof construction above the mangrove poles have been left out for clarity of illustration. The lower photograph here was taken in March 1972 at the old palace of Sheikh Abdullah bin Jassim on al-Salata prior to the work of reconstruction being carried out as part of the creation of the Qatar National Museum, and illustrates a typical treatment of ceiling corners. Using a similar technique it was possible to produce external corners, characteristic of some rubble walls, which is a particular feature of Gulf architecture. Walls constructed out of stones and mortar can’t be bonded to each other effectively in the manner of bricks, and the corners of such buildings are, in consequence, a relatively weak point. Gulf master builders got round this by building into the corners short lengths of mangrove pole on the diagonal at a high level within the room. Internally the soffit of the triangular corner was usually decorated and, externally, the building featured a set-back or rounding which reflected the structural need to stretch out the point of weakness. The walls may or may not have had additional poles inserted in their height, this illustration showing only the diagonal bracing at ceiling cove level. Buildings in the interior were generally fortified, as mentioned elsewhere, so openings had to be restricted in order to maintain security as well as being located well above ground level. This was also true, to some extent, of houses on the coast where there was the possibility of attack by raiders. This, and the requirement for privacy for the family, led to the characteristic blank ground floor walls of urban settlements. But one of the main requirements of protective structures was the need for them to retain stability under attack. The weakness of the wall construction was countered by their being relatively thick, itself a consequence of the need for structural integrity. However, the weakness of unbonded walls is at their corners and bases where, under sustained attack, they will fail. So, in defensive structures such as the Kuwt in Doha and the towers in the photograph above at Umm Salal Muhammad, the corners are rounded and their junctions with the ground are thickened. These towers, incidentally, are known as the Barzan towers, but I have not yet been able to find out if this is the specific name for these towers or for watch towers generally. The door threshhold – ataba – and the ground floor of the house – the hejjar – were always raised at least 150mm above the normal external finished external floor levels in order to prevent flood or rain water coming into the house. Where possible houses would be located on slight rises in order to make sure that they were not inundated. Dry river beds – wadi s- were avoided as significant flows of water can rise rapidly creating damage and, in some cases, causing death. Advantage was taken in the ceilings to use the construction as a decorative feature of the space below. Suspended floors, ghurfa and ceilings were supported by shandal, usually round, mangrove pole beams or danjal, timber beams, on top of which were placed, in the better houses, a decorative woven reed, hassira, or woven cane, basjeel, layer visible from below and over which was a woven palm mat, manqrur – to receive the first of at least two layers of well tamped down earth. In this photograph you can clearly see the shandal taken through the outside wall to obtain maximum structural bearing. Here is an example of the look of a ceiling in an ordinary Qatari traditional house. The use of the materials described above can be clearly seen with the very simple crossed pattern of bamboo canes directly on top of the mangrove pole beams supporting the roof. Compared with the example below it, the ceiling materials are honestly displayed and not finished by painting. However, the mangrove poles are usually black as is seen in this photograph, an effect brought about by their being treated with bitumen, a process considered to prolong their life. It was obviously not considered to be a fire risk. Here is a similar ceiling, but one that is within a building on the verge of collapse. In this case the mangrove poles have not been treated with bitumen or any other finish either to preserve their life or for decorative effect. The split canes have been laid at right angles to the poles, compared with the diagonal pattern above, and the matting above it has been laid diagonally. This is a simple ceiling in a simple room and represents the basic construction of a roof on an ordinary, single storey building. To compare with the simple, untreated ceiling finish above, here is a photo illustrating the decorative development of a traditional ceiling, this one being located as part of a reconstructed development. In this example, the hassira, or cane has been painted a strong primary colour and the manqrur above it, appears to have been given a coat of lacquer. The shandal, appear to be at least polished, the combination of finishing providing a more sophisticated appearance for the room in which the ceiling is located. You can also see that a ceramic ceiling fitting has been incorporated in the ceiling, suggesting that a central light is to be installed. This is certainly not a normal finish to such a ceiling, where the lighting would have been provided from kerosene lamps attached to the wall. The above examples of ceiling treatments illustrate the how the basic constructional requirements of a ceiling were carried out in practice. They represent the simplest way in which the roof is constructed, and how this reflects in is appearance. In fact, they represent the majority of ceiling treatments and are an honest reflection of construction. Here, however, is something slightly different. In this case a decision has been taken both to use more canes than would have been structurally necessary to support the matting above them, but also to add colour by painting the canes. The colouring pattern is irregular. Red and green predominate and there may be some painted black, though it is hard to tell. It is also possible to see a bit of red paint on two or three of the mangrove poles. What guided the decoration of the ceiling is difficult to tell, but it is certainly an interesting departure from the norm. Note, too, that there is the remains of a qatiya at the far end of the room that would have been used to create a little privacy from those using the room. Where the room was to be more important, then additional interest could be introduced by the simple expedient of adding, as shown here, a central motif as well as painted canes running at right angles to the and the shandal. Note that the colours used are red, yellow and black. Although blue – particularly light blue – was used in decoration, I don’t recall seeing it used on simple ceilings such as this, though a light blue paint was used in the reconstruction of the palace of Sheikh Abdullah, now the Qatar National Museum, and illustrated here, as well as in the photograph taken in a different complex a little lower in the page where there is an obvious allusion to the colour of the sky. These sketches illustrate the construction discussed above and provide the basic floor and ceiling elements. If a higher quality ceiling was required a timber boarded ceiling was suspended below the roof and was then painted with a two-dimensional design, usually geometric but sometimes with naturalistic flourishes, though this would be rare. Generally the decorations were really developments of the simple geometries used in Qatar and took advantage of the range of simple paints becoming available in the country. An example is given in a photograph on the preceding page which shows a majlis demonstrating a reconstructed ceiling at the Qatar National Museum in Doha. In the photograph in that paragraph you can see how the natural materials were used decoratively when there was less money available to produce a boarded ceiling. The sketch immediately below it illustrates the elements which make up the structural elements supporting the roof or floor. The second sketch gives the construction of the roof in a little more detail, illustrating the way in which the roof finish was supported. The earth used to finish and provide falls to the roof sat on the manqrur which can be seen supported by the hassira resting on the shandal. Below these elements can be glimpsed, in the upper sketch, the free area of ceiling left exposed by the cantilevered coving. The examples above are all of floor or roof constructions in buildings of the traditional architecture of the peninsula. But the manner of construction continued even when some of the materials available to builders changed. To some extent this would have been a commercial decision based on the costs of alternative materials, but it also reflected the manner in which many builders wished to continue to work or where house owners wanted to continue a tradition which they knew would produce structures with less thermal gain than the new reinforced concrete roofs provided. In this example the walls of the house have been constructed of the standard single skin of concrete blocks. There are no concrete columns or beams, the building being constructed no differently from a traditional structure. But there is a difference. The roof is constructed of sawn timber softwood beams let into the concrete block walls, probably with no strengthening of the blocks at the points of bearing. On top of the beams overlapping manqrur mats have been laid on basjeel which can just be glimpsed top right in the upper photograph. This is the secondary distributor of the roof weight and allows access by the builder during the building stage. The manqrur mats are partially let into the external wall to provide continuity for the two layers of earth to come. In the second photograph the builder is tamping down the first layer by stamping over the roof. This photograph, taken in a small village outside Riyadh in 1981, has been placed here as a reminder of the basic roof construction shown above, but this time associated with a domestic mud wall construction. Despite the damage to the building, the finishing of the roof and its integration with the wall is quite clearly visible, particularly the two layers of tamped earth laid on the matting. I understand that, in the Bastakia area of Dubai, the roof was constructed with the application of layers of clay brought over by dhow from Bandar-e Lengeh on the Iranian coast opposite Dubai, where that material was plentiful. I assume that the clay would have been mixed with a quantity of sand to reduce the tendency clay has to crack when dried out. The earliest means of access between floors is likely to have been a simple sallam, or ladder arrangement. In the early buildings ladders were constructed by the incorporation of mangrove pole into the corner of rooms, as in this first photograph, taken in Umm Salal Muhammad in the 1970s. This method had a number of advantages being conservative of a precious resource, timber, minimising the amount of floor area taken up with vertical access and, to some extent, giving additional stability to the corner of the hasa wall construction which, in comparison with bricks and blocks, suffers from the ability to create a strong bonded corner. While salaalim have significant advantages in many respects, they are not always easy to use and may even prohibit some from gaining access to upper levels. This photograph clearly shows how early stairs were constructed. A number of mangrove poles span the distance to be covered, and steps are constructed on this base from a mixture of hasa and juss. There is an obvious limit to the span of these poles which accounts for the usual arrangement being to have darajaat organised in half flights, or to incorporate winders. The first of these two photographs illustrates a straight external run of steps, while the photograph below shows part of a staircase which had both straight runs and winders. Note that the bottom of the staircase has been finished with juss, though the supporting mangrove pole has been exposed. This photograph, looking up inside the manara of an old masjid in the north of the country, illustrates the construction of the tower’s circular stairs that give access to the openings at its head, and from which the faithful would have been called to prayer. This is the method used for constructing winders and creates a sound construction. Note that some of the mangrove poles have had a jute rope wrapped around them. There are, apparently, two reasons for this. The first is that it helps to strengthen the pole when it is stressed by having either static or active loads applied to it and, secondly, to allow a coating of juss to obtain a better purchase. Here no coating has yet been applied, but it is probable that the poles were wrapped having this in mind. When a water-resisting seal was needed for a roof – sat’h – a layer of juss cement was used, sometimes washed with a coat of nuwra to reflect the heat as well as provide a small degree of waterproofing. However, the integrity of roofs relied more on their ability to shed water quickly than on the ability of the juss to inhibit water penetration. In this photograph you can see that the structural mangrove poles drop from left to right by at least 100mm to provide a fall for the finished roof. I don’t know if this was the way it was intended that falls were created for the roof surface, the layers above being parallel to the mangrove poles, or if it was a way of increasing the roof’s fall. Generally roof falls are created by laying the finishing layers to fall on a horizontal base. It seems unusual aesthetically to have a ceiling sloping the way this does, but it is not the only example I have seen. Having said that, where ceilings are finished by boarding, those I have seen are nearly always horizontal and, I assume they were not levelled from an underlying sloping ceiling structure as can be seen illustrated in this photograph. But, to contradict myself, here is a photograph I took in Wakra in the mid-seventies, of a boarded ceiling which shows a slope in the lowest plane of the ceiling ̵ the plane which incorporates the diagonal corner pieces supporting the heavy cornice above them. There appears to be a slope of about 50mm from left to right which can just be seen above the horizontal chevron moulding. I very much regret that I can’t recall where I took this photograph nor why the structural beams appear to be set at an angle of 45° to the structural walls rather than at the normal right angles. It is the only example of its sort that I can recall. But that is not the only unusual feature. The combination of mangrove poles and planed beams holding up the floor has been established on a regular pattern. The building was being renovated and I believe the rationale for this design arrangement was that it was felt the mangrove poles were too light to take the floor and so squared beams were added as a way of reinforcing the structure. Although the photograph above was taken in a room, most probably a majlis, this photograph was taken of a verandah in Wakra and illustrates the manner in which beams may be taken around a corner. In many ways this is the easiest way to accomplish the turn though it is wasteful of timber. The method does, however, keep the ceiling at the same level all the way around, requiring neither a deeper beam system nor any cutting of the ends of the beams, just cutting them to length. Although I have seen this pattern of ceiling beams using mangrove poles, here the timber is softwood and has suffered deterioration. Note the relatively wide width of the verandah. This together with the timber ceiling beams indicates that the building is not particularly old. You can see from the above that there is a variety of ceiling treatment in traditional buildings, albeit small as there are only a choice of a few materials to use, and little modelling other than can be provided at the periphery of a room through variation of the cornice. In this photograph, of a wide verandah at Duhail, you can see the simplest arrangement. The mangrove poles run across the width of the verandah at between 250-300mm centres, split bamboo canes run parallel to the verandah at about 150mm centres, and above the canes is the matting supporting the roof finishes. Note there is no shortening of the mangrove pole span by the use of a cornice. In fact the mangrove poles rest directly on grouped mangrove poles that form the beams along the verandah arcade as can be seen in the photograph below. It is commonly believed that a good roof will normally keep water out for about a good two days’ continual rain and, as continuous rain is not a feature of the Gulf, this must have seemed a reasonable approach to take. In addition to this it should also be remembered that most owners did not possess much which would suffer from the ingress of rain, and that the materials of construction and decoration were not expensive. 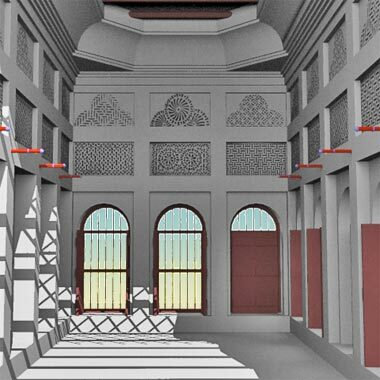 This notional drawing was made to illustrate a developed section through a traditional majlis or similar structure. It shows the trabeated character of the construction which automatically creates the opportunity for recesses in the wall, the beams above them spanning approximately two to three feet. Both inside the room and externally there is an attractive rhythm set up along the walls by this structural system. These recesses were used for display or the storage of a variety of items either by fitting them into the recesses or by the incorporation of shelves. Items are also hung on pegs, awtad, let into the wall as well as on nails driven in to hold guns, bags and a variety of objects. The drawing shouldn’t be taken as being completely accurate as, for instance, there would be more than a single mirzam leading water off the roof. Although I didn’t mention it above, it should be understood that the finishing of roofs was not all that accurate and ponding was likely. The need to shed water as quickly as possible will have led for the incorporation of the numbers of maraazim commonly seen. 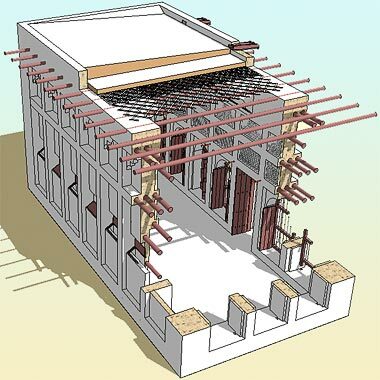 In addition, within the structure, infill panels were used within both the internal and external recesses to accommodate solid panels or carved naqsh panels, the latter providing decorative interest as well as, in some instances, the possibility of ventilation through the fretted panel, as in this top example on the first floor of the wind tower building in the centre of Doha. While this example has a rational logic to it in providing light and air to an upstairs room, this second photograph of a room in old Wakra illustrates a rather different arrangement. It appears that, at some time in the past, there were two naqsh panels bringing air into this ground floor room at a high level, the top panel being in the form of a small, round-headed panel similar in size to the blind panelling adjacent to it. At some stage the juss on the walls seems to have broken away or cut back to the structural wall and repaired, crudely, with a cement render, but the surface left unfinished. Perhaps this was also the time when the lower naqsh panel was sealed from the other side, though that seal has been partly broken as well. A further feature of the walls was the occasional incorporation of wooden pegs, awtad, on which visitors could hang their bisht or cloak. These were usually built into the vertical structural element of the walls rather than within the recesses as I showed in the notional drawing above, and were painted in bands of primary colours. You can see from this example to the right the part that was built into the wall, and the turned and decorated part which projected. The ends of these four awtad show a little of their character, the more refined one on the right is illustrated in its length above where it can be seen to be relatively sophisticated compared with those on the left. Where used in a majlis, the awtad will normally all be the same design. One notable feature of ordinary buildings is that the mangrove poles over which the roof was constructed were permitted to project from the face of the building. There are arguments that this would be useful as a base for maintenance as they are in some parts of Africa and that, by taking the beams right through the wall, the bearing of the beams on the wall would be maximised. However, these are unlikely to be the main reasons. Firstly, the majority of buildings were of single storey height and there is little problem in reaching the top of the walls with elementary equipment and, secondly, the amount of pole bearing on the top of the walls was quite sufficient for supporting the roof as they could be cut at or near to the face of the building. It is probable that the reason for permitting them to project without cutting is that they were a valuable resource which might be used at a later date when their greater length might be of use in a slightly wider building. This may also be the reason that timbers above openings were often far longer than was necessary for structural reasons – though I have to admit they would have additionally benefited the construction at their longer lengths. Note that this mangrove pole is not bound as is often the case when used as a lintol, usually in conjunction with one or two others to span the width of the wall above. The purpose of the binding appears to be both to counter any tendency for the pole to split as well as provide an improved purchase for the juss and stones of the wall above. Previously I mentioned that there was a practice in Saudi Arabia of incorporating wood into faruwsh walls in order to strenghten them. I don’t believe this is such an example as there is little of it, the wall is of desert hasa, and it is not repeated in the height of the wall. Although the mangrove pole above was not reinforced with a kumbar binding, here are two photographs demonstrating how the builders used this feature. In the upper photograph the pole is being used as a beam to span between columns and supporting the upper panel of a badgheer system. The panel is constructed the width of the mangrove pole and consists of juss covering the panel which will either be made of juss, or of a mixture of small stones and juss. The panel appears to have been made in two stages as it can be seen that there is an outer layer that has been worked to a smooth finish with a level piece of wood. The relatively thin layer at the bottom of the panel is liable to cracking and breaking as has happened due to movement and mechanical damage. In the lower photograph the beam is supported by three mangrove poles, side by side, each of which are individually bound with a kumbar binding which is visible on the right of the column. This detail was photographed at Al Wajbah in the nineteen eighties and incidentally presents an attractive decorative detail at the junction of column and beam, as well as illustrating the usual relationship of a mirzam – virtually always directly above a column. Also note that the column is relatively slender and octagonal in plan. As mentioned above, it is certainly a fact that many of the better traditional buildings did not have beams projecting from their faces. The timbers would be cut off at the external face of the structural stonework, with the finishing juss covering over the trimmed end as can be seen on the left of this photograph, which was taken in Wakra in 2002 when the building was in the process of being renovated. The more expensive buildings which exposed the ras ad danjal, usually had them trimmed to the same length, though not as shown in this photograph taken in Doha in 1975. Note that these are plane-squared timber beams and not mangrove poles, and would have been a far more expensive item to purchase. Some beams, in fact, had their ends decorated by being cut to a similar pattern as is shown here. It was only the poorer houses which left them untrimmed to a variety of lengths. Having said that, I notice that the photo below has mangrove poles of different lengths. This is likely to be because the house originally was not a prestigious development, but has now been refurbished for use as a museum in the centre of Doha. I have seen mangrove poles that have been squared off in section, but not in Qatar. I would imagine that this was an issue relating both to engineering as well as to cost. Squaring off a mangrove pole reduces its cross-sectional dimensions, particularly its depth, creating an intrinsically weaker beam. A pole with a greater diameter would have to be bought in order to provide the equivalent strength in a squared-off beam to that of a smaller diameter pole. In order to direct rainwater from the roof two devices were used. The more expensive constructions would employ a mirzam, a gargoyle or water spout, let into the wall at intervals of about two metres maximum. This photograph shows a set of them on the wind tower building in the centre of Doha and illustrates that they are not only a very necessary functional requirement but also present an aesthetic benefit to the façade in improving the three-dimensional effect of the façade both by their projecting presence as well as when introducing projected two-dimensional solar shadows. Notice how they are always centred on top of the structural columns rather than between them. I assume this is because it is intended to ensure water doesn’t fall against panels, but rather against the more solid columns, and also to ensure there will be no interference with any horizontal structure spanning between the columns. Having said that, it is also notable that there must be a weakening of the column above the mirzam where the columns form part of a badgheer as they do here. On ordinary roofs with no access, the mirzam was simply built into the top layer of the earth or juss finish to the roof and projected from the horizontal at a downward angle of about 10° and to a distance, preferably, of at least 600mm from the face of the building. This photograph shows a row of maraazim illustrating, on the right, how the edge of the roof is built up to its junction with the wall face in order to prevent water running down the wall, so damaging the relatively soft material. It is imperative to channel water off the roof as quickly as possible. In the distance there is a view of a mirzam from the front, showing its relationship with the edge of the roof and the roof itself. Interestingly it is directed to fall over a narrow doorway and onto steps. These gargoyles were constructed of three pieces of timber forming a u-shaped trough, at the bottom end of which would be a small cross-piece of timber below the lip whose purpose it is to resist water running back under the mirzam and damaging the wall. The assembly of the mirzam is helped by the addition of another cross-piece of timber on top, keeping the two sides in place. In some cases this piece of timber would be just nailed to the top of the mirzam but, as in this case, it was rebated into the sides in order to produce a stronger junction. There is also the possibility that this might have been a way to avoid using expensive nails, relying solely on the mechanical junction of the timber construction. As mentioned previously, maraazim need to shed water from the roof as fast as possible. This is usually effected by a relatively thick roof – which also assists in keeping the structure cool – but one which has a significant fall across it towards the maraazim. However, this photograph suggests that the roof finish may be relatively thin at the point at which the maraazim direct water off it as, on the right particularly, the mirzam appears to be almost at the same level as the mangrove poles supporting the roof. There is obviously a danger with having a thin roof finish as that is the only way of resisting the penetration of water, there being no real waterproofing material used in roof construction. The leakage on the walls around the mirzam illustrate the difficulty of making their junctions with roofing and wall materials waterproof. This need to shed water rapidly can create difficulties in the coherence of the roof finish, as is illustrated here. The harder, juss, finish of the top of the wall can be seen, clearly distinguished from the roof finish which is of softer compressed earth as illustrated in two of the photographs above illustrating the construction of a roof in the 1970s, but will have changed little in centuries. But there has also been minimal upkeep to the roof finish as rainwater falling on the roof has eroded the earth. While this is not yet serious, there is or was evidence in many old rooms of water ingress at the junction of roof and wall. The fact that there was often little to damage within the rooms might suggest that this may have been a reason for roofs not being kept in sound order. In earlier, simpler buildings where timber was not readily available water was moved from the roof by the simple expedient of making a slight declivity in the edge of the roof – normally standing slightly proud of the roof finish in order to reduce erosion – and permitting the water to fall down the face of the wall – mirzam a’amoudi. In order to protect the wall a vertical gutter was formed down the face of the wall with raised edges at its side to channel the water and prevent the water spreading over the wall and, at the foot of the wall the channel was rounded away from the wall in order to direct the water away from the house over the ground. It is noticeable in the photograph of the mud building discussed above – the photograph repeated here – that there are two significant vertical channels down the face of the mud brick wall. These were vertical rainwater channels which means that the structure would not have had an ’arish roof, but that it would have been flat. In order to protect the mud walls from irregular erosion, and in the absence of wood to make maraazim to shed the water away from the building, rainwater was channelled off the room directly to run off over the ground, it being accepted that there might be some erosion which was easily repaired. These next two photographs illustrate an important feature of many old buildings when timber would have been considered a rare commodity. The vertical gutter, mirzam a’amoudi, was apparently a feature of many of the simpler buildings, particularly those of mud brick construction. Most of these structures were constructed in the interior of the peninsula. The first photograph is of a group of buildings at Umm Salal Muhammad where there were three vertical gutters but where the owner has subsequently taken the opportunity to improve the drainage of his roof by the incorporation of wooden maraazim into the position where the vertical gutters used to be. The result is an interesting anomaly. Vertical gutters or runnels were simple to construct from the materials to hand. Invariably there are two ridges protecting their sides to prevent water escaping sideways, and leading the rainwater to the ground where it would be moved away from the structure as effectively as practicable. The second photograph, made at Wakra in December 1981, illustrates more clearly the simple nature of the device. It was not only the smaller domestic structures that incorporated vertical gutters in their walls. This photograph is of part of the fortified wall at al-Wajbah, west of al-Rayyan. These gutters lead water from the first floor level walkway which surrounds the inside of the fortified wall. It is interesting that the rainwater falling on the internal walkways should have ben led off and away from the building rather than captured and used internally. In all these vertical gutters there appear to have been no attempts made to collect the water at ground level. Rainwater would have been considerably sweeter than much of the well water which was often brackish yet it seems that the rains were thought to be more of a problem than a benefit. There appears to have been an intermediate stage in the manner in which the mirzam developed, and that is shown here in a photograph taken at Umm Salal Muhammad in November 1977. Here a group of maraazim are incorporated into the roof of a tall structure, apparently formed out of the same juss with which the surface of the wall has been treated. There is no staining on the wall, which seems unusual as the maraazim obviously are not able to throw rainwater far from the wall. Because of this it seems that the maraazim are a relatively recent addition to the building and have been deliberately selected over timber even though it is unlikely this would have been difficult to source at Umm Salal Muhammad.